4 Ways to Become an Extrovert - An introvert is more difficult to adjust to the new environment and, usually, more dominated by extroverts. For teenagers who have introverted nature, the school will become a bit difficult because each child is asked to be brave and perform in the classroom. If you feel the same way at school or your workplace environment, it may be time to you to turn into an extrovert. But, transformed into extrovert is also not easy. Perhaps the following will help you to be able to turn into a fun extrovert. Caution: Convincing yourself that being introverted is not a fault, but in any case, you have to keep learning to adjust in the neighborhood. Transformed into an extrovert does not mean that being introvert is a mistake. You just have to turn out to be better than before. That is beginning to open up to new things, as was done by ekstroverts. Introvert, as we understand it, love the world of their own. I admit that it tends to make you look cool. But maybe you should get out of the comfort zone, or at least, you have to start doing things you never did before. If you usually enjoy a weekend at home, you should start going out for just shopping. 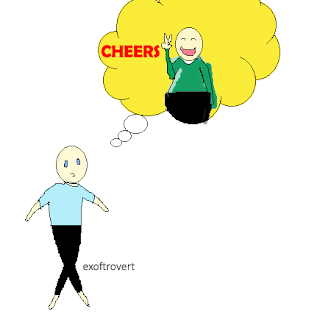 To be an extrovert, you can start to observe the characteristics of extroverts. What they do, how they react to something, or when they begin to interact with others. You can adopt their habits that makes them seems amaze to you. More involved with something and peoples. Extroverts sometimes looks great because they have high social skills (see also: Improve your social skills ability). First, you must understand how can you get involved with other people. You can follow the activities that previously never entered, for example, participated in the summer camp event with colleagues from work or school. Being such an extrovert will not work you do if you do not feel sure and confident about what you're doing, which is to be better than ever. You have to be absolutely sure and confident that you can do better. Being an introvert who wants to be like the extrovert does not make you look bad. Instead you're trying to look better for others. And trying is one of the best keys to gain success.